You need to set your goals for your family and household to give you a roadmap for your life. This roadmap, your family goals, gives you a direction for how to proceed in your family and home life. Blindly doing certain actions without giving consideration to the path they are taking you down is not a good way towards fulfillment and happiness. If you end up in a good spot using this ad hoc method it is because of luck, not skill. Why depend on luck when setting goals is a more sure way to get to the destination you desire? When you begin to set your goals you need to sit down with a pad of paper and a pen. For goal setting to be more likely to stick you need to write your thoughts down, where you can refer to them later. In fact, I urge you to put your family's goals and mission statement, once completed, in your household notebook, because this is a place you and your family with reference frequently. Once you have pen and paper in hand, the next step to set your goals is to imagine the type of environment you want to live in, and what you desire for your family (including you) to feel and how you desire for them to act. Think about this for the present, for one year from now, five years from now, and ten years from now. There is no right or wrong answer to this mental exercise. Only you know what is important to you and your family, and everyone's situation is unique. Now that you have a picture in your mind at these time intervals, write it down. These thoughts and desires can be pretty amorphous sometimes. For example, when I think of how I want my family to feel both now and in the future, I want everyone in my family (including me) to feel loved and cared for. Is that a goal? Not really. I would call that an overarching desire. It is still pretty abstract, and on its face it can be hard to figure out how to accomplish it. It seems so big. If you've got some overarching desire like that written down, your next step to set your goals is to break this overarching desire down into smaller pieces, like puzzle pieces. That is what your goals should be -- puzzle pieces that fit together to create the picture you want. So, how do you break this desire down into goals? That can be pretty tough, and take some real thought. You need to think of what smaller action, or group of actions, would help you make forward progress toward that desire. In the example above, the desire for everyone in the family to feel loved and cared for, some things that might contribute to that feeling are for everyone always to have clean clothes, a warm and snuggly bed to sleep in each night, good food eaten together as a family, and time to spend with each person doing things together. These (and many more) activities, put together make the picture desired. So, some of the goals for the example are to have a clean and organized home and family meal time together on a consistent basis. Once you have goals of the size and magnitude listed above, write these down next to your overarching desire. Remember, these goals are not set in stone. Things happen everyday that can make us reassess our priorities. That is alright, life happens. Because of that I suggest that you revisit these goals periodically, at least once a year. This gives you and your family a chance to see what you have accomplished, and also to make new goals or tweak old ones so they reflect what best fits you and your family at that time. Setting your goals is really a never ending process. Generally, when you set your goals you write down the things you have identified that need to be changed. Before we focus on these further, I would also like you to sit and think about what you and your family are already doing that is working, and getting you closer to your overall desire. It could be that you already read to your kids consistently, or keep the kitchen clean, or everyone can always find more toilet paper when they need it. No matter how small, you are doing something right already, and you need to identify what those things are, and feel good about them. Then, write them down next to your goals and desires. Remember when you start working on your goals not to let the areas in which you are already doing a good job backslide. You need to maintain those areas of your family life that are already functioning adequately. There is no reason to start completely from scratch and throw out perfectly good systems right now. Later on, when other things have improved you may make improvements in some of these areas too, but one thing at a time. That leads me to the next step to set your goals for your family and household. You must prioritize your goals. Not everything can change at once. Each of us is a creature of habit, and habits can be hard to break. You prioritize your goals by identifying the one that needs to be changed the most. That is the one you focus on first. Prioritizing can be very difficult when you set your goals. In regard to prioritizing family goals, it is sometimes easiest to identify what the biggest problem your family is currently facing, and work to resolve that. Ask yourself, if I could fix just one thing now, which one would give me the most comfort, relief, or get me the furthest down the path toward my overarching desire? Is it, for example, that you and the kids cannot seem to get out the door on time in the morning, so you need to create a "launch pad" to place all the items on the night before, or that your child complains that he doesn't have any clean underwear, and you need to create a laundry schedule? This site is all about household management, and focuses on families, especially those with children. 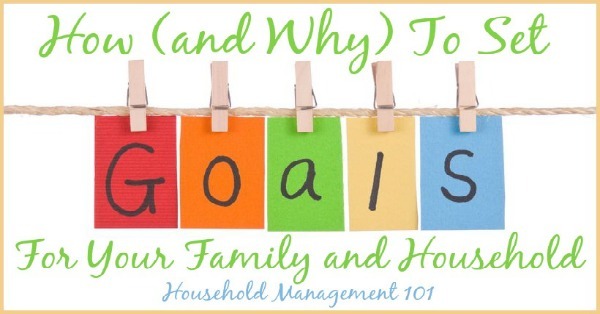 Therefore, those are the types of family goals I am focusing on here -- things like laundry, home organization, house cleaning, meal planning, and chores, for example. If you know what area you need to focus on first, please go ahead and explore that area of the site to help you develop the action steps necessary to meet your goals. Sometimes, however, things are so overwhelming that you don't know where to start when you set your goals. What action can you take to make the biggest impact right away when everything seems to be a problem? At times like this, sometimes any action going forward is better than no action. Take the Household Management 101 course from beginning to end. Trust that every small step forward will bring you closer to your goals, and more importantly, your overarching desire. This will happen through the awesome power of the Household Management Snowball. You know what happens to a small snowball that gets rolling down the hill, and how it keeps gathering both speed and weight as it goes? The same thing happens as you improve the functioning of your household. Each area that improves feeds on the others, and all of a sudden you can see the light at the end of the tunnel. It is not enough, of course, to just set your goals. You have to have some plan for how to achieve them. 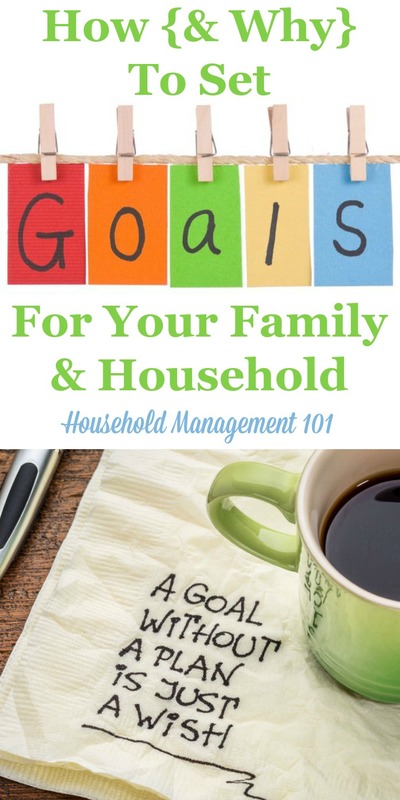 That is really what this whole website is about -- how to achieve your household and family goals, and also how to work towards your overarching desires, such as the desire for you and your family to feel loved and cared for. Whatever you choose as your first goal to conquer, you should take consistent small steps towards it to achieve it. Why small steps? Because they are a proven way for you to succeed, and are not so overwhelming that you give up without ever really even getting started. Small steps also help you build positive habits, routines, and schedules which is at the heart of household management.